Please note that the following photos are intended to show what the shrimp look like in general. Since these are all wild stock animals, and since many shrimp are variable in coloration, the actual animals you get may vary in color, pattern, and/or intensity of color. This is especially true of the bumblebee shrimp, red-fronted shrimp, and cherry red shrimp. The photos are there as a guide only, and I can not guarantee the coloration or patterns. For the best reference in algae eating fish and shrimp Check out Robyns informative page. This table is by no means complete nor may it be 100% correct but it will give you an idea of which species of algae-eating animal you may want for your aquarium or pond. Both the likelihood of eating algae and eating plants applies to adult specimens and not to juveniles. Some species propensity to eat algae varies with age such as with most of the algae- eating fish. The species that are most available at the aquarium or pet store are those that the salesperson is most likely to try to sell to you. They also often cost a lot less than the other, less- available species. Do not let a salesperson sell you an animal that is not appropriate for your particular situation. For example, do not put a plecostomus in a tank under 40 gallons unless you plan to give it a larger home later, or do not put one of the smaller species below in with larger animals that may eat it. 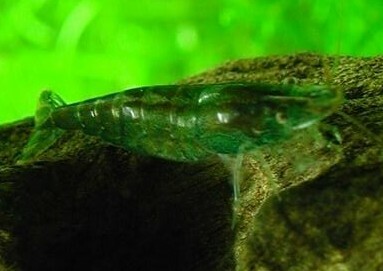 This is THE algae eating shrimp. Another small (1/2") algae-eating shrimp. 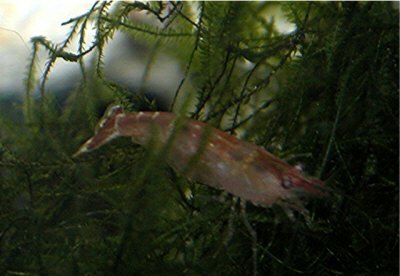 As with the emerald grass and rainbow shrimp, these shrimp are also variable in color. It is also similar in shape and size to the rainbow shrimp. like the other Caridina, is variable in color. Blue Midget Shrimp Caridina sp. A small shrimp, getting no larger than 3/4". A decent algae eater. Blue Shrimp 6 shrimp Neocaridina sp. 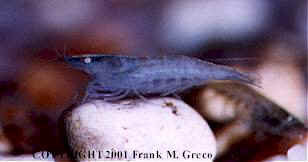 The chameleon shrimp is a medium-sized shrimp not suitable for mixing in with smaller fish. It is predatory in nature. Note the hairy coating on the claw of the adult male. This is normal, and usually happens to the alpha male.